Bradbury AR and Plückthun A (2015). Getting to reproducible antibodies: the rationale for sequenced recombinant characterized reagents. Protein Eng Des Sel 28, 303-305. The road to antibody validation standards is paved with good intentions. In fact, the final destination is improved reproducibility of pre-clinical research. However, to arrive here, it is taking the combined effort of the entire life science research community to lead the way to reliable antibodies for science. Through a series of publications, online forum discussions and meetings in recent years, the scientific community has come to an agreement that a standardized set of guidelines is needed for antibody validation. The hope is that commercial antibody suppliers and researchers will diligently apply these guidelines, and funding agencies and publishers will enforce them. The Global Biological Standards Institute (GBSI) has pioneered this effort and recently hosted a meeting at the historical Asilomar grounds in California, USA to discuss actionable solutions and strategies for developing antibody validation standards, policies and practices. The meeting brought together over 100 leaders representing academia, pharma, commercial antibody manufacturers, academic journals, funding agencies and policy makers. Just a few weeks prior to this meeting, the 2nd International Antibody Validation Meeting was hosted in Bath, UK, which also saw major players in the scientific community and antibody industry meeting to discuss improving reproducibility in pre-clinical research. In this blog post we highlight some of the current potholes on the road to reproducible antibodies as discussed at these meetings and in associated discussion forums. One of the main issues that was immediately apparent from the discussions at these antibody validation meetings is the need to train junior researchers in antibody validation best practices. A survey by the GBSI demonstrated that 30% of researchers with fewer than five years of antibody use indicate that they “do not see the necessity” of validating their antibodies. In addition, an informal twitter survey indicates that 29% of researchers think that poor training contributes the most to reproducibility problems. This demonstrates an urgent need to provide training on a standard set of guidelines for antibody validation that is widely accepted by the research community. The European Monoclonal Antibodies Network has taken up this task by hosting a workshop to train young scientists on antibody validation. It is however recognized that more systematic training is required. One suggestion included integrating antibody validation training as a stipulation of fellowship awards for junior researchers. Another suggestion involved the implementation of “just-in-time” training based on the Nanocourses model at Harvard University for students and investigators switching into research disciplines that require antibody use. In his presentation at the 2nd International Antibody Validation Meeting, Professor Jim Trimmer, Director of the NeuroMab facility at UC Davis pointed out that the success or failure of antibody validation only holds for the application and the conditions under which it was tested. He mentioned that in addition to focusing on how antibodies are validated, it is equally important to focus on what applications they are validated for. This was also a key theme at the Asilomar meeting, which led to the consensus that antibody validation standards need to be developed on an application specific basis. Some antibodies may work well in certain applications, and poorly in others. 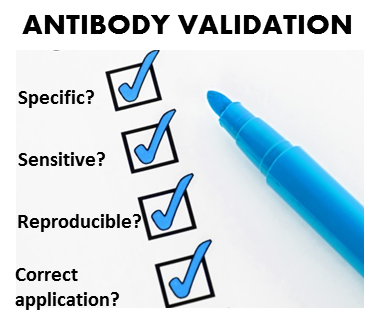 Therefore it is important that the end user know which applications an antibody is validated for and also those for which it failed validation. Along these lines, a recurrent theme was the need for antibody suppliers to demonstrate transparency in their validation processes, thereby assisting scientists with their own in-lab validation process. Are recombinant antibodies the way forward? In 2015, Professors Andrew Bradbury and Andreas Plückthun penned a commentary article proposing that in the long term, biological research should focus on the use of sequenced recombinant antibodies (Bradbury and Plückthun 2015). While it is understood that these antibodies will still need to be validated using standard and widely accepted validation practices, their adoption in biomedical research has a number of advantages. Wide spread use of recombinant antibodies could address some of the challenges of the reproducibility of non-recombinant antibodies. For instance, because recombinant antibodies can be characterized at the molecular level (their sequence is known), scientists are able to reproduce experiments with the confidence that they are using the exact antibody. Currently, traditional antibodies are generally not characterized at the molecular level and are therefore hard to confirm by users. In addition, lot-to-lot variation exacerbates the challenge of experimental variability. The widespread use of recombinant antibodies therefore improves product consistency and experimental reproducibility and reduces the need for routine and repeated validation. However, the main disadvantage of such an approach discussed at these meetings is the higher costs associated with recombinant antibody production compared to antibodies made by animal immunization. Another major concern is the proposal for the open availability of recombinant antibody sequences. This presents intellectual property issues as manufacturers cannot guarantee that the recombinant antibodies they produce will not be re-produced by others. Accordingly, it would not be cost-effective to patent every recombinant antibody in a commercial catalog based on their market value. Other methods of protecting the intellectual property discussed included the use of trademarks and copyright. A potential solution to these limitations that was proposed involves the implementation of an independent third party to hold sequence information and release accession numbers. However, it was also noted that researchers may not find sequence information useful, particularly if antibodies are thoroughly validated. At the Asilomar meeting, a plan to create a scoring system for antibodies was proposed. The idea is to generate a ranking system that will help researchers choose reliable antibodies suitable for their research needs. The scoring system will address key characteristics of antibodies that allow them to achieve their intended scientific purpose. This will involve assessment of whether an antibody binds the intended proteins and not non-specifically as well as whether it works in the desired applications. However, while this system would certainly improve research reproducibility, how to implement it is still an open area of discussion. The scientific community at Asilomar widely accepted this proposal but acknowledge that there are certain holes in the plan, such as where the researchers would find the scores for antibodies and how such scores will be verified. Dr Leonard Freedman, head of the GBSI, proposes that the first step is to establish definitions of how an antibody should be validated. In a press release after the meeting, it was announced that the fundamentals of what would become the first detailed standardized guidelines were defined at this meeting. Moving forward the goal will be to move beyond the concepts of antibody validation towards a set of clear, practical steps that can be widely accepted and implemented. Emphasizing the importance of antibody validation for intended applications, the GBSI states that application based working groups will define appropriate validation standards and steps for implementation in 2017. It would therefore appear that the scientific community is not too far from its destination of reproducible and reliable antibodies for science. As the industry leader in western blotting equipment, Bio-Rad has scaled up its antibody validation efforts for the western blotting application. Learn more about our PrecisionAb™ antibodies for flawless western blots.